Cube - No, not that confusing film from the '90s. 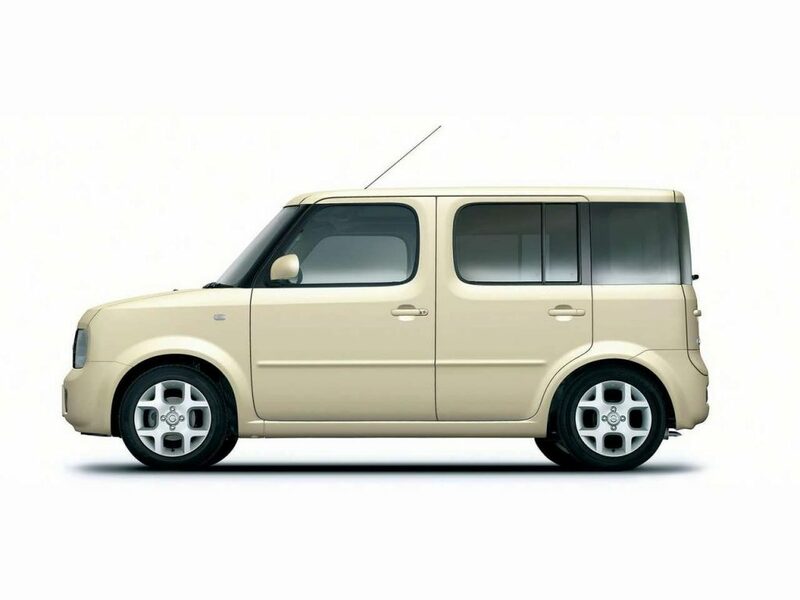 This is a confusing Nissan. 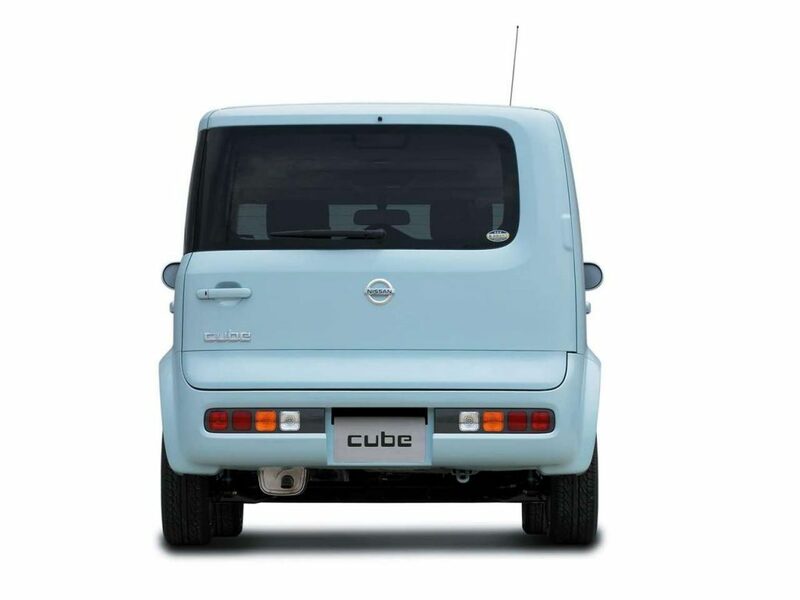 The Nissan Cube. If you could build a car out of a big Lego Duplo block, this is what it would look like. When you hear the word cube, the last thing that pops into your mind is a car. The multicoloured puzzle? Obviously. The odd 1997 sci-fi/thriller/we have no idea/horror movie? Also acceptable. OXO? Most definitely. But never do you think of a car. 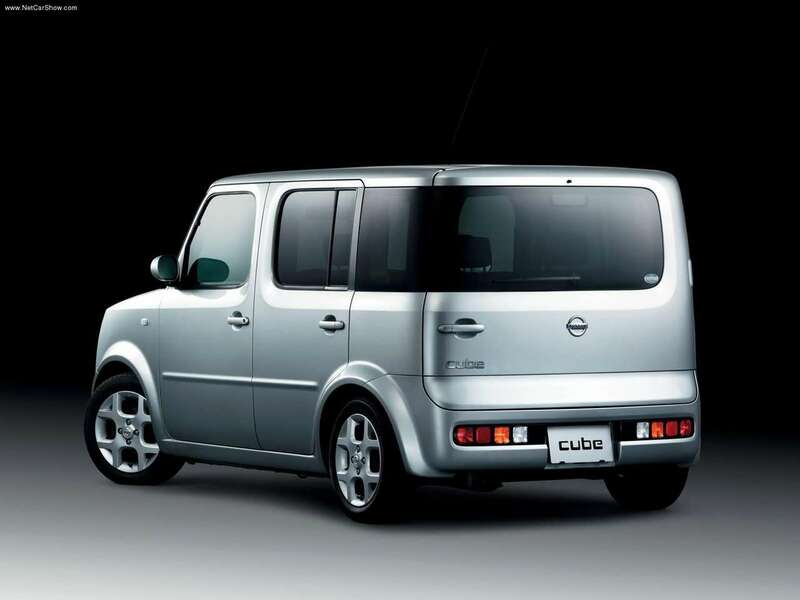 Nissan, being Nissan, realised there was a gap in the market on the cube-shaped front, so it made a car and called it then, um, well, the Cube, obviously. And it was as cubed by name as it was by nature. Take a look. 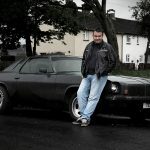 No curves were harmed in the making of this motor vehicle. It’s an odd little duck isn’t it? Something akin to a five-year-old’s drawing of a car making it all the way from initial concept to production. Seriously, was it a bet? Did someone at Nissan HQ bring their child to work one day, only for said sprog to leave a doodle in the Xerox machine? How did this wheeled oddity make it into production? To be honest, the Cube’s inception doesn’t really matter. We’re just glad it is here. The world needs more rule-breakers. At least in a design sense. We’re not suggesting you go and rob the local Post Office. Don’t do that, it will not end well and this post will not serve as an alibi. Got it? Back to the Cube. To quote Mike Skinner, it doesn’t conform to formulas. Is anyone really sure what it’s trying to be? Yes, it makes perfectly adequate family transport, but then it can also be used as a rudimentary camper of sorts. Or as a deeply practical mobility vehicle for the disabled (brilliantly, Nissan offered it with an array of accessibility options). Failing that, you can yank the back seats out and use it as a small van (though this will require commitment and spanners). Short of being a convertible, it really is all things to all men. Its confused purpose just adds to the enigma. It also means the Cube appeals to a large cross section of people. 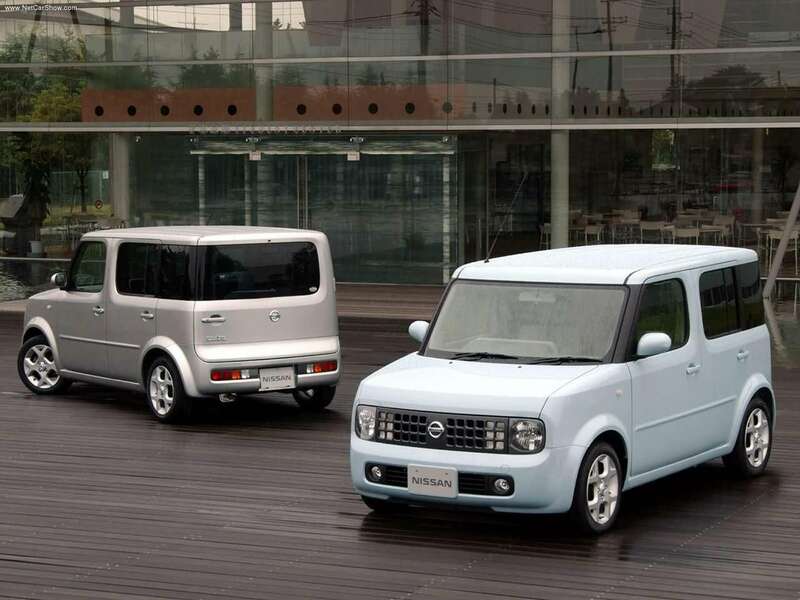 Though that’s only if those people can wrap their head around the unique aesthetic of Nissan’s boxy little number. It’s definitely an acquired taste, as well as being a car best avoided by shy, retiring types. You’d think that a car shaped like a box of Frosties would be lacking in design features. The Cube, however, is not. Not by a long shot. 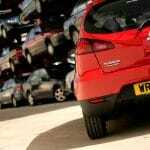 Nissan has managed to cram a lot of features into the design, all without overwhelming the basic shape. First of all, there’s the inescapable fact that it’s different on either side, thanks to a rear/side window that only wraps around one quarter of the body. It’s also got a cheeky little face featuring some nice detail in the grille as well as in the bumper. Then there are the alloy wheels, which despite being round, still manage to incorporate a cubed design. Clever stuff. Given the wacky nature of the Cube, you’re probably thinking that its innards are lined with fish scales, the dreams of otters and silk. Sadly, that’s not the case. 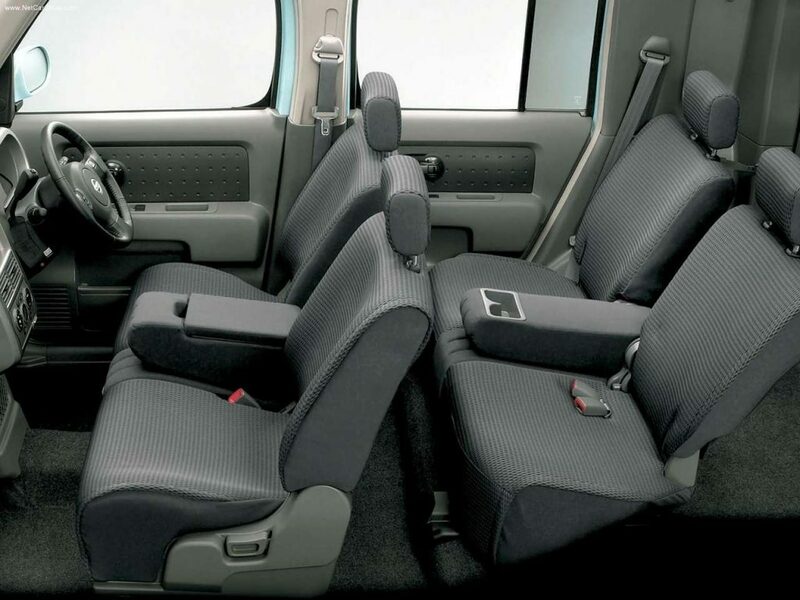 Instead, you get five seats or, in the case of the version with a slightly longer wheelbase, seven. They don’t spin, eject, burst into flames or play the theme tune to Pokemon. They simply play host to your bottom. A missed opportunity there, Nissan. The roof does look like a puddle in later models though, which is nice, if you’ve ever wanted a car’s interior to look like a pud… no, you haven’t, have you? In fact, the whole interior is pretty drab. But it’s functional, so there’s that. And the dash is cubular (that’s not a word, is it? ), though we would have liked to have seen a square steering wheel akin to that of the Allegro. Again, another missed opportunity by Nissan. Mechanically the Cube is powered by a hydro-mega-spur-drive with optimum giblet power and thrust gibbons. Actually, that’s a lie. 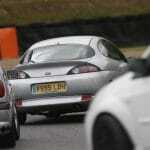 For our budget you’ll be looking at a 1.4 16 valve petrol with a dizzying 96bhp. It will also be mated to an automatic transmission, driving the front wheels. We’re sorry, we know that’s not exciting. 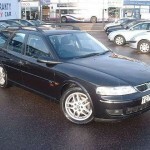 It was also available with a 1.5 petrol as well as a CVT (constant variable transmission), but given there is no thrust, nor any gibbons, you don’t really care, do you? Fundamentally, we’re talking about a car that literally had the aerodynamic qualities of a brick, so expecting any kind of performance is optimistic. On the road, the Cube… drives. It’s not remarkable, though it’s not horrific. 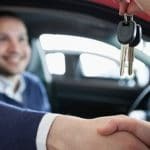 Obviously wind noise is an issue, and the ever-increasing wail of the CVT will drive you to the brink of insanity, but that’s about all there is to report. The brakes make it stop and the circular – not square, Nissan – steering wheel helps you point it roughly where you want it to go. Good. None of that matters though. You buy a Cube because you’re making a commitment to being a bit different. 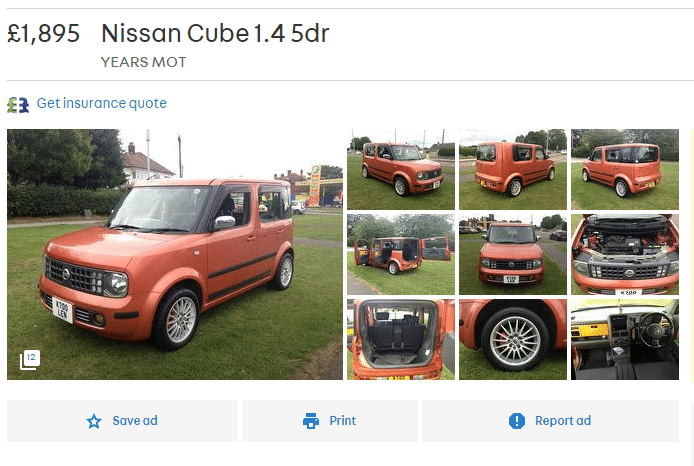 Nobody has ever, or will ever buy a Cube because they simply need a car. Buying a Cube is a deliberate choice. And that’s fine, more power to you. Go out there and be the person in Lidl’s car park that makes Derek and Susan raise an eyebrow as they park their Rover 25. It’s good to be that person. Live a little. We must admit, Cubes aren’t exactly commonplace in the sub £2,000 sector, but we found this one which we’ve screen-grabbed as proof. So in your face. If you want a car to be a car, nothing more, nothing less, that’s fine. But there’s nothing to stop you having a bit of fun with it, and that’s exactly what the Cube is. It’s fun. It makes you smile. It also makes you feel special, thanks to there being so few on the roads. Not a lot of cars can boast that.